An 11-page illustrated travel guide to Murano, Italy, an island in the Venetian Lagoon where glass has been made for more than 700 years. In English-speaking countries, glass artisans are often performer-pitchmen at craft shows and festivals, where they blow glass baubles for a few dollars or pounds each. 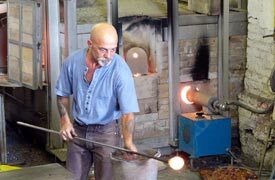 But there was a time when the trade of glassblowing--indeed, glassmaking in general--was an elite pursuit dominated by craftsmen in the Venetian Republic, most notably on the island of Murano in the Venetian Lagoon. ABOVE: A glassblower offers a free tourist demonstration at the V.I.A. fornace near Murano's Colonna waterbus stop. "Supplying quality glass products since 1291"
Such pampered treatment had one catch: Glassmakers weren't allowed to leave the Republic. If a craftsman got a hankering to set up shop beyond the Lagoon, he risked being assassinated or having his hands cut off by the secret police--although, in practice, most defectors weren't treated so harshly. What made Murano's glassmakers so special? For one thing, they were the only people in Europe who knew how to make glass mirrors. They also developed or refined technologies such as crystalline glass, enameled glass (smalto), glass with threads of gold (aventurine), multicolored glass (millefiori), milk glass (lattimo), and imitation gemstones made of glass. Their virtual monopoly on quality glass lasted for centuries, until glassmakers in Northern and Central Europe introduced new techniques and fashions around the same time that colonists were emigrating to the New World. At the retail level, there's a growing emphasis on art glass and--most important of all--the souvenir trade. To be fair, Murano's artisans do produce beautiful works of contemporary art from glass, although some of the designs are by foreign artists. Visit the better galleries and showrooms on Murano, and you'll find works that are technically and aesthetically stunning. Also, don't miss the island's glass museums and leading churches. To plan your trip to Murano (which is only a few minutes from central Venice by public waterbus), use the navigation table or the "Next page" links at the bottom of each page. If you collect Murano glass, be sure to see our descriptions of books about Murano and its glassmaking industry, along with our page on Murano glass restoration and repairs. José Antonio Santiso Fernández (3), Eliza Snow (4).